1972 Barry Bennett - Nat Young Pintail 7 ft 6"
Fibreglassed foam blank, 1/8" redwood stringer, laminate pigments. Left: 8' x 5.25" base x 9'' span @ 6.5''. 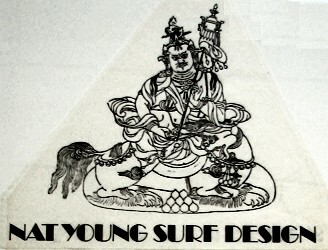 Deck: Oriental illustration and Nat Young Surf Design text at sweet spot in black and white. Bottom: BB (red?) diamond at nose. Deck: white pigment with dark blue rail lap and black pinlines. Catalogue # 100 at the Sydney Surf Auction, Harbord Digger's Club, 19th October 2008. Images and dimensions courtesy of Mick Mock, many thanks. 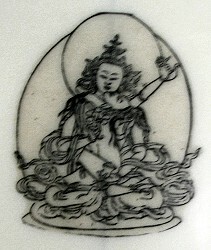 Very poor photographs due to camera problems. 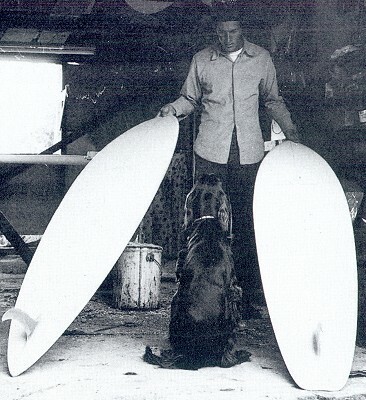 Nat had already experimented with rounded pintails during 1968 in the lead-up to 1968 World Contest in Puerto Rico, typified by his Ski for California's Weber Surfboards. 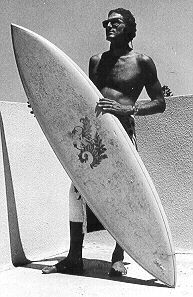 the Two early pintail design precedents were shaped for Nat Young by Harold Iggy at Weber Surfboards for the Hawaiian winter of 1968-1969 and ridden to 5th place in that year's Duke Kahanamoku Contest. We ended up in Hanalei Bay and got to witness Joey Cabell surf Hanalei at 18 to 20 feet. The Smirnoff contest kicked off at Makaha Beach in the last week of November (1969) and I was using a beautiful 8-foot 6-inch down-rail gun inspired by Cabell, with a 9-foot board as backup. 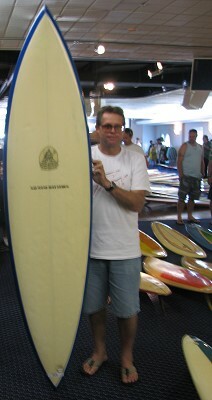 With no surfboard company to appease I'd got Cabell's shaper Steve Teau to shape both of the boards before I left Kauai. 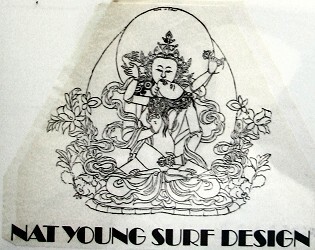 - Nat's Nat (1998) page 228.
turned the property's old farm-machinery shed into a surfboard factory, building the glassing stands myself and, with Garth Murphy's help, a shaping stand. 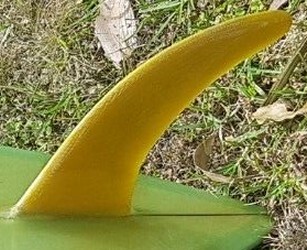 I modelled them on the board I was riding at that time, a scaled-down version of those Cabell had been surfing in Kauai; 7-foot long by 20 1/2 inches wide, a double-ended pintail with soft, low rails tucked under to an edge. - Nat's Nat (1998) page 236. 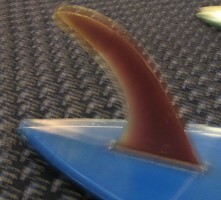 The design featured a compressed pintail gun template, 2nd phase concave bottom, soft box rails with a hard edge, large nose lift and a small Greenough single fin. Tracks October 1971, page 14. Note Pintail and Squaretail (Backhand) model. While MOTE is packed with an incredible amount of high quality surfing performances, the sequence featuring Nat Young (in his regulation red board-shorts/long-sleeve vest) at Broken Head, NSW, is arguably the most outstanding. From the 1970s this would come the dominate the way waves ridden, with straight-line surfing generally confined to riding deep in the curl. Unknown volunteer assistant and Nat pintail. Sydney Surf Auction, Harbord Digger's Club, 19th October 2008. Above images: Sydney Surf Auction, Harbord Digger's Club, 19th October 2008. Courtesy of Mick Mock, with many thanks. Geoff Cater (2008-2017) : Nat Young- Bennett Pintail, 1972.